Outpatients and the NHS are set to benefit from a new standardised approach to patient care, according to two top doctors’ organisations. 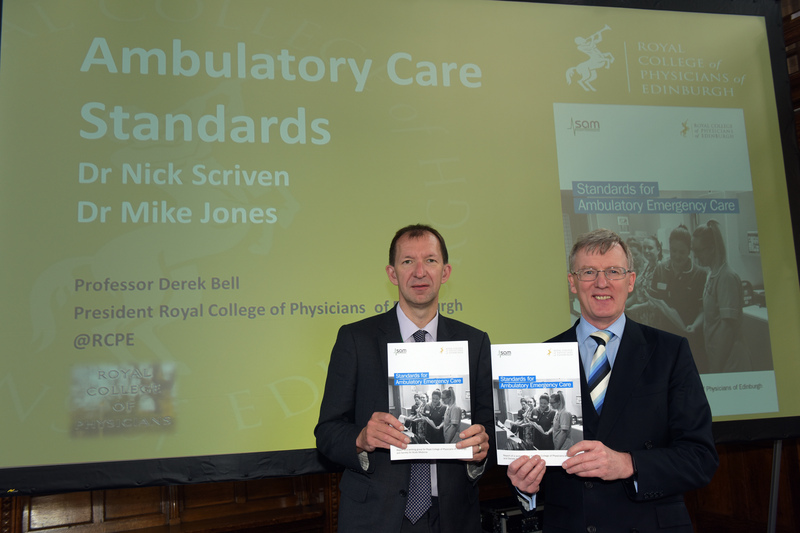 The Royal College of Physicians of Edinburgh (the “College”) and the Society for Acute Medicine (SAM) have jointly produced standards for Ambulatory Emergency Care (AEC). The standards were launched at Manchester University on Friday 12 April, to mark the first time that the Council of the Royal College of Physicians of Edinburgh – which has doctors from all four corners of the UK - has met in Manchester. The College has a base in Manchester, through its sister partner RCPE Manchester, which is a partnership with Health Innovation Manchester. AEC is a service that provides same day (outpatient) emergency care to hospital patients where they can be assessed, diagnosed, treated and are able to go home the same day, without being admitted overnight. AEC is an important service which provides same day hospital care to patients. AEC units treat a wide variety of common conditions including headaches, diabetes, deep vein thrombosis and cellulitis. These joint standards by the College and SAM aim to define the standards that should be adopted in Ambulatory emergency care units. We think that patients deserve to be seen by a doctor or a nurse promptly, and then to have the best treatment possible. We believe that these standards will speed-up and improve patient care, and ensure that patients have clear advice on what to do if their condition deteriorates after being discharged from hospital. They should also reduce admissions and readmissions, free up valuable hospital beds for those patients who most need them and provide a much needed boost for our hard-pressed hospitals, the staff who work in them and the NHS as a whole. The Society urged The UK Government in the report ‘Winter 2018/19 in the NHS: The solutions’, to look at ‘how much could be achieved with investment in this area’ and address why the implementation of AEC units was ‘not standard or uniform’ across the country. This was followed by the incorporation of AEC into the NHS England Long Term Plan with a target of increasing the proportion of patients looked after in this way and the establishment of a joint NHSE/specialist societies group to make this a reality by late 2019. Underpinning the process has been a real need for standards written by a group of experienced physicians who work in that area and are seen as subject ‘experts’. This is the first time that standards for AEC units have been produced, and it is hoped that all providers, those writing health policy and those commissioning services will adopt them as soon as possible.